"Dear Linda & Family, The pain & sorrow caused by..."
"Im so sorry for your loss. I have found out so much about..."
Charles William (Chick) Domann, 95, died Thursday evening, August 23, 2018. Charles was born on the family farm in Mooney Creek, 15 miles south of Atchison, on November 18, 1922, the oldest son of Ben and Genevieve Cunningham Domann. He attended elementary school at Oak Grove School in Mooney Creek and was a 1940 graduate of Winchester High School. In high school, he was an honor student, lettered in all sports and was an All-League basketball player. He later played in many games of organized baseball. He was a lifetime farmer and cattle feeder. He married Joan Tandy 69 years ago on August 8, 1949 at Sacred Heart Church in Atchison. He always proudly referred to her as "the nicest and prettiest girl in town." A lifetime member of Corpus Christi Church in Mooney Creek, he served as a lector and council member. He was a friend of education, serving 10 years on the Board of Education for USD #339. 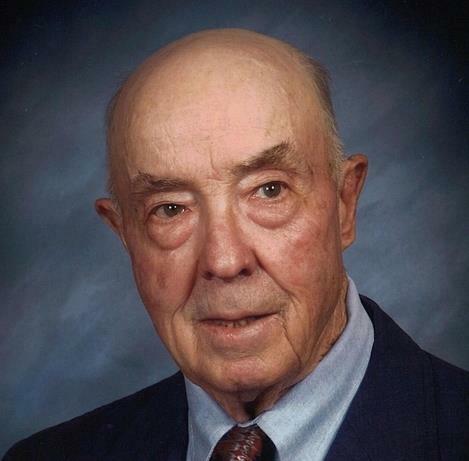 He was also a bank director and longtime member of the Kansas Crop Improvement Assn. He was a kind and generous man especially dedicated to his family. Charles was the oldest living member of his Domann generation in which he had 5 siblings and 72 first cousins. He was preceded in death by his parents, his sisters, Maxine Allen and Merrill Domann, his brothers Donald Domann and Robert J Domann, and grandson, John Robert Nugent. He is survived by his wife of 69 years, Joan, of the home; four children, Marilyn (Buehler) Domann (Stephen Bonebrake) of Lawrence, Mary Linda Nugent (Robert) of Wichita, John Charles Domann (Amy, sons Thomas and Daniel Steichen) of Mooney Creek and Mark William Domann (Carleita) of Collierville, TN; four grandchildren, Benjamin Charles Buehler and Jennie Buehler, both of Washington D.C., Kathleen Tandy Winters (Dan) of Andover, KS and Jenna Domann of Charleston, SC. He is also survived by his brother, Leslie B Domann, sister-in-law, Alice Lee Domann, 3 nephews and 8 nieces. Memorials may be sent to Saint Benedict's Abbey and Benedictine Sisters of Mount Saint Scholastica and Jefferson County Home Health and Hospice. Rosary and visitation will be held at Corpus Christi Church in Mooney Creek, 18760 Rogers Road, from 6-8 pm on Sunday, August 26 with Requiem Mass there on Monday, August 27 at 10:30 am. Interment following at Corpus Christi Parish Cemetery alongside Domanns, Nolls and Schricks, lifetime family, neighbors and friends. Lunch provided at the Parish Hall by the Corpus Christi Altar Society.